Wanna get more materials to upgrade skills of your child in Homestead? Great! Parchment Chest(Uncommon), Magic Dust Chest(Uncommon) will show up here! Lvl. 10 PATK+CRIT Damage Gem and Lvl.10 MATK+CRIT Damage Gem, which are newly added in game, will also be available here! 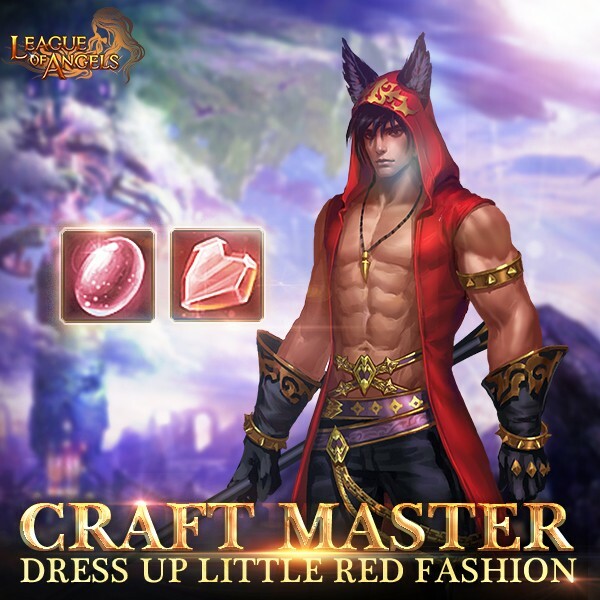 Apart from the above, you also have a chance to dress up Little Red Fashion and obtain 5-star Equip Card to add stats to your heroes! Also you can obtain Xmas Tree Chest, Reindeer Statue Chest, and Chritsmas Decor Chest to make your Homestead more beautiful! After collecting specified materials, you can craft certain items, including Lvl. 10 PATK+CRIT Damage Gem, Lvl.10 MATK+CRIT Damage Gem, Xmas Tree Chest, Reindeer Statue Chest, Christmas Decor Chest, Lvl.12 Crit Damage Gem, Flaming Flower, Khaos Core, Divine Blessing Stone, Rare Flaming Stone, Adv. Soulstone, Lilac Stone, Mythic Divine Stone, Elena's Icon Shard, Servant's Outfit shard, Lover's Reunited, Element Crystal, Element Scroll, Magic Socketing Rod, Awakening Stone, Lvl.9 Fusion Gem Chest, Lvl. 10 Cherubstone, Lvl. 12 HP+PATK Gem, Lvl. 12 PATK + Hit Gem, Lvl. 12 Dodge+Hit, Lvl. 12 Agility+Hit GemLvl. 11 Agility Gem, Lvl. 11 HP+ PATK Gem, Lvl. 11 Dodge+Block Gem and etc. 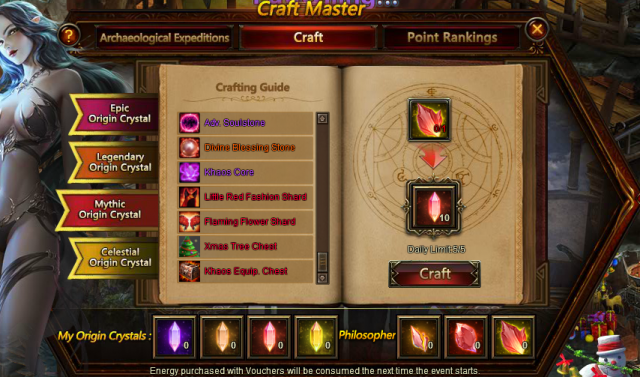 This time Craft Master brings you many skill books with lower discount than before, such as Skill Book-Divine Light, Skill Book-Void Cloak, Skill Book- Shield Rampart, Skill Book-Star Splendor, Skill Book- Mysterious Shandow, Skill Book- Abyssal Gaze, SkillBook- Blood Frenzy, Skill Book-Thunder Storm, Skill Book-Demon Chant, Skill Book-Thunder Strike, Skill Book-Swift Blade, Skill Book-Radiant Guidance, Skill Book-Dragon Fury, Skill Book-Firestorm, Skill Book-Divine Wrathstrike, Skill Book-Eternal Rampart; And other resources such as Runestone, Seraph's Stone, Enchanted Ore, Angel Tears, Grotto Heart and more! More exciting events are coming up through Jan. 8 to Jan. 11 (Server Time), check them out in the in-game Hot Events menu now!